Welcome to Wagnaria!! 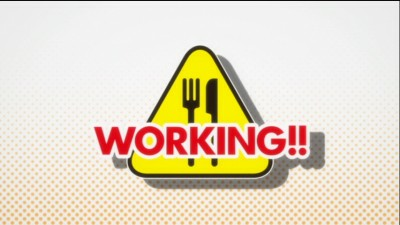 That's the name of the family restaurant featured on the show (which goes by the same name as the show itself of course) and it translates to mean "Working" (plus the exclamation points). 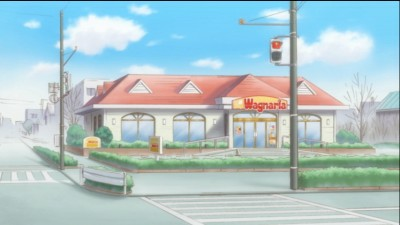 The series almost entirely takes place at the restaurant and most of the primary characters are employees there. The show begins as a somewhat typical comedy anime but the overall plot eventually winds up shifting and dramatically transforms into a romantic comedy. Bet you didn't see that one coming! The characters are all a bit zany and offbeat. That is one of the appeals of watching this series because it lends a certain degree of unpredictability that helps to benefit the humor. The first few episodes were a bit slow to start though and the first two episodes in particular (written/storyboarded by Yoshimasa Hiraike) were actually my least favorite episodes of the entire 13 episode run (each technically referred to as a "recipe" to keep with the restaurant theme). There was too much questionable/perverted humor early on and it was something that initially disappointed me. I wasn't sure I was going to like the sense of humor on the series and if I hadn't liked the humor at all that would have been disastrous in regards to actually enjoying the story being told. 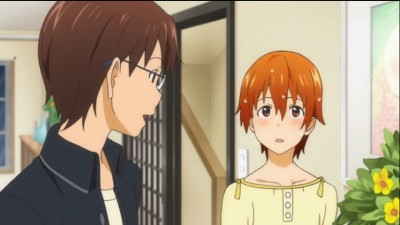 Takanashi is possibly the lead character. I say possibly because he is the only character on the series where you occasionally get to see multiple characters who are related to him and his storyline but that fall outside of the restaurant setting. This is really an ensemble piece of storytelling and that makes it difficult to pin-point one particular character that is focused on more than the others, but it is easier to clarify the series as having two leads: Takanashi and Inami. Inami is a sweet girl who has a crush on Takanashi but who has a terrible habit of punching every man she sees (Ouch). Her father was cruel to her by making up stories to her as a child about how all men are wicked in this world and that ultimately prevented her from having any healthy relationships with men. Takanashi is a bit of a weirdo who apparently likes "small, cute things" (including gerbils and stuffed animals). He initially joins the staff because a really short girl asks him to when she is desperate to hire a new employee. The age gap between the characters is only one year but the humor employed early on in this series made for some rather weird moments. 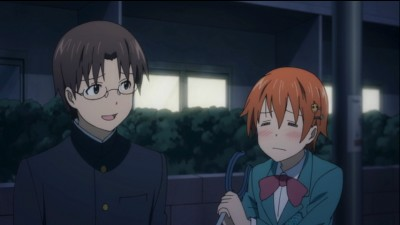 Over the course of the series these two main characters (Takanashi and Inami) will bond and become closer as friends. The punching doesn't completely stop but Inami tries with everything she has to become more male-friendly and less punch-y. The romantic element springs up to pose the question: Will Inami ever get over her fear of men and can these two seemingly different characters care enough for one another to actually fall for each other? It's the central question of the entire show. Can two oddballs connect emotionally? The rest of the characters are just as odd though. There's a waitress who totally crushes on the female manager and share's love stories with the cook (who is a guy with a major crush on her). Maybe that doesn't sound so weird... but she does wear a Katana sword on her belt. The cook then vents his frustrations out on everyone around him but in generally nice ways. Everyone calls him the "nice guy" (which in a strange way he sort of is - at the very least he seems to be the nicest character on the show). For further confounding oddities: How could I forget the character who essentially blackmails everyone into doing all of his work for him or the fact that the restaurant manager never likes to do any work for herself at all? 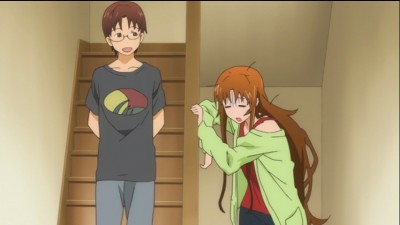 If this hasn't already been emphasized, I should state that the Wagnaria staff is a pretty eccentric bunch. This is definitely a series where viewers will want to preview an episode or two before making a purchase decision - primarily because the humor on the show can often be entirely subjective. There were moments where I laughed and moments where I didn't. Cringe-worthy moments sometimes occurred. Its humor offered up some pretty mixed results. The thing that makes the series work as well as it does is the fact that it eventually grounds itself when it emphasizes the romantic element of the story and focuses primarily on making the plot move forward (even if it is a simple plot-line). The characters can carry the series quite well from this point because they are well established and are likeable as well. The writing may sometimes be a bit bumpy but it's strong enough to warrant the romantic storyline. The animation is fairly standard for this type of comedy. 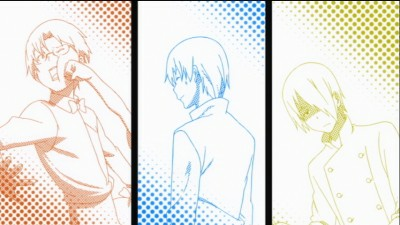 The backgrounds are simplistic; the character designs are distinctive but are relatively familiar in style when compared to other anime series out there. It's an amazingly clean looking show with good enough designs to keep the production interesting, but the simplistic approach doesn't make this a series where stylistic animation is what keeps a viewer watching. It's worth noting that aspect. This almost entirely character-driven romantic-comedy series is worth checking out for fans of quirky and offbeat anime series. The conclusion is left somewhat open-ended but doesn't disappoint and the direction remains interesting from start to finish. It probably didn't hurt that the opening theme was catchy fun. Anyone who thinks this series sounds somewhat enjoyable should give it a chance and it might just become a wonderful surprise for some. Wagnaria!! is presented across 2 DVD's with an anamorphic widescreen 1:78:1 transfer that preserves the original television broadcast aspect ratio. This 12 episode long anime series has frequently bright colors that spring to life with ease and that provide viewer satisfaction. The transfer isn't perfect though, and it does seem a bit softer than desirable during certain scenes. The overall presentation is strong enough that this release won't disappoint fans. The 2.0 Dolby Digital audio is a bit disappointing when compared to the video presentation. The series lacks much separation and the overall sound levels seem a tad lower than they probably could be. There isn't much to the sound design but the opening/ending credits do feature energetic songs that sound well reproduced. The dialogue is also easy to follow and understand. 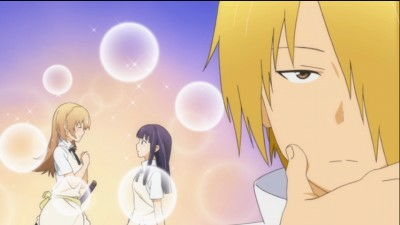 Wagnaria!! is presented with only the original Japanese language dub and with optional English language subtitles. The box art doesn't promote any bonus materials as being included on the set at all and it barely does. There are clean closing credit sequences and that is all that is included as an extra on this release. 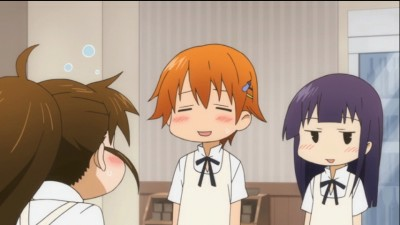 Wagnaria!! is a pretty entertaining show for the most part. It has strange, quirky characters that keep the show interesting most of the time. The romantic plot-line also provides the series greatest moments. Fans of romantic-comedy anime series will want to check this series out as it may just be a nice little surprise series. The DVD PQ/AQ is worthwhile. Unfortunately, the lack of any substantial extras does disappoint. Recommended.